Situated on the Cnr of Koreelah St and Clarence Way, Bonalbo, next to the district Hall, this is a lovely little park to stop and take a break in. Toilets are located nearby, and there is a café open some day’s in the Community Hall next door. 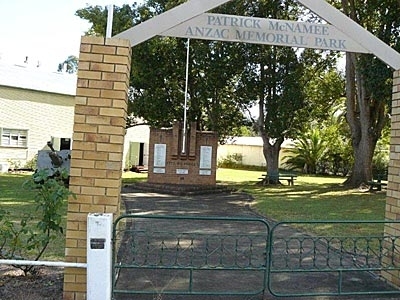 Patrick McNamee ANZAC Memorial Park was established on land donated by Mr Patrick McNamee and dedicated in memory of those who served in World War One. The Memorial Park was officially opened in 1938. In 2017 a Bronze Statue of “The Bonalbo working dog” was unveiled in the park as a tribute in marking Bonalbo as the birthplace of working cattle dog trials and to honour our working mates.